Born in Cagliari, Sardinia, Italy, Adele Madau is one of her country’s few avant-garde violinists. She studied violin with Mila Costisella, contemporary music with Enzo Porta and jazz and composition with Bruno Tommaso. The CONCERT OF FLAVORS AND SOUND is a Gourmet musical performance, a format of a show created in 2006 by Adele Madau that offers the combination of menu tasting and live music created for each course. It is a sensory concert-dinner, where the flavors, aromas, sounds and presentation of the dishes, are meant to evoke feelings, emotions, stories, pictures and memories contained in the memory of the diners. 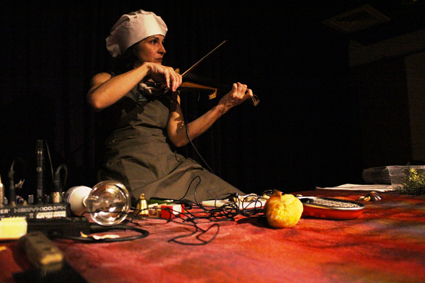 The music created for each dish, is performed live, with kitchen utensils used to make the recipes, an electric violin, live electronics and live voices. The recipes inspire stories, stories affect the soundscapes that blend with the flavors and smells of the dishes, strengthening the evocative capabilities. A trip down memory lane through the simultaneous stimulation of the 5 senses. The examination of the brain shows how the five senses recall the past. If a sense is stimulated to evoke a memory, even more are called into question. How many times do smells or a sounds bring back memories and images of the past to us? The same Marcel Proust said that "the smell and taste of things remain long deposited, ready to re-emerge at any time." Through music and gastronomy, we can simultaneously use all the senses.